"These are delicious steaks, good with potatoes, vegetables, and Irish soda bread." Heat vegetable oil and butter in a heavy skillet over medium heat until butter has melted. Cook and stir onions in butter and oil until lightly golden brown, about 10 minutes. Push onions aside with a spatula. Place steaks in the skillet, leaving the onions to the side, and cook over medium-high heat until meat is browned but still lightly pink inside, 2 to 4 minutes per side. Remove the skillet from heat. Slowly pour Irish whiskey into the hot skillet (be careful, whiskey fumes are flammable). Mix browned onions into whiskey and bring to a simmer over medium-low heat. Sprinkle steaks with salt, black pepper, and parsley; turn steaks over in whiskey pan sauce to coat both sides, and serve drizzled with sauce. If desired, light whiskey fumes on fire with a barbecue lighter and allow to cook until the flames die out, about 1 minute. the taste was alright. i definatly would change up the recipe next time and make sure the steaks are not frozen and fresh. This was really yummy! I used two ribeyes and served this with Smoked Bacon and Irish Cheese Mash. Flambe them if you can, it helps soften the whiskey flavor. Thank you!! Big hit at our house. 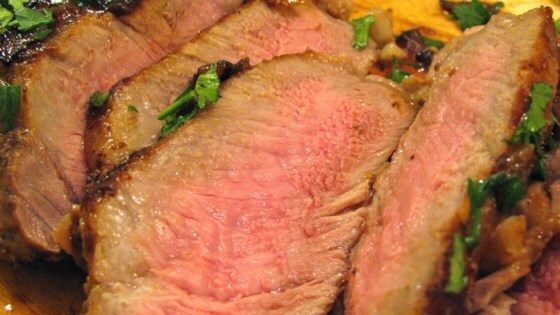 I used a big fat london broil which required a lot of extra cooking time. Okay, this was a great recipe!!! My Hispanic son-in-law said he really liked Irish food, I served this with colcannon and a side veggie. What a great meal. Thanks for sharing this one with us.